Northwest Door & Sash Company specializes in using select, clear, vertical grain Douglas Fir, using mortise and tenon joinery featuring true divided lites. In addition, we have extensive experience in other popular and exotic woods. Combining traditional craftsmanship and current technology, we have captured the essence of a quality product: functional and long-lasting, pleasing to the eye, and committed to today’s energy standards. At Northwest Door & Sash Company, we consider ourselves purists. Our respect for tradition is evident in how we handcraft solid wood windows and doors using time-honored joinery and construction techniques. While the beauty and authenticity of our standard products is something in which we take great pride, we are also strong proponents of restoring old wooden windows whenever possible. Retaining the original components of historic homes and buildings preserves the look and feel and maintains a tangible connection to the past. Sometimes, however, wooden windows are beyond salvation — and that’s where we come in. Rather than replacing the old wooden windows with vinyl or aluminum, NWDS can create new, solid wood windows that match their predecessors almost exactly, while also providing superior energy efficiency. 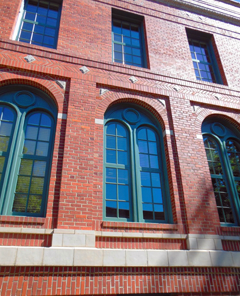 By replacing your windows, you not only preserve the historic look of your building or home, but you can also gain the energy savings that new windows provide. Advanced weatherstripping and glass coatings, in addition to incredibly precise tolerances, create a much more energy efficient window than previous versions.